Chris Hughton insisted that Brighton & Hove Albion’s relegation destiny is in their own hands despite seeing their five-point cushion over the Premier League drop zone evaporate. A 2-0 defeat against 18th-placed Cardiff City saw the gap between fourth-from-bottom Albion and the Welsh side cut to just two points. The loss comes off the back of a chastising 5-0 home spanking by Bournemouth on Saturday meaning, for the first time in 12 years, they have suffered five consecutive defeats in all competitions. But Hughton remained confident that Brighton have enough ‘resilience’ and ‘quality’ to retain their Premier League status. The Seagulls said: “It’s a general deflated feeling at the moment, because we’re coming off the back of a big loss for us. “But as a team, as a club, and as individual players there is only one way we can ensure we can stay in this division. “That is by fighting as hard as we can and making sure that, if we are not able to score the goals that we need, we’re not conceding. “We have shown enough resilience and quality and togetherness within this group of players at various times in this division. “It’s been a bad week, but the players have no choice but to turn it around. The only way they can turn it round is by working hard. Albion fans have not had much to cheer at the Amex in the second-half of the season. 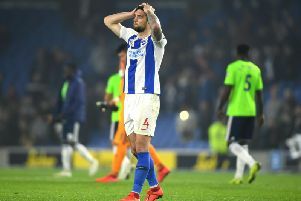 The Seagulls have won just once in seven Premier League home games in 2019, and only arch-rivals Crystal Palace and relegated Huddersfield Town have scored fewer home league goals than Brighton’s 17. The Albion faithful showed their displeasure during a torrid display against Cardiff, as a cacophony of boos sounded out at both half-time and the games end. Despite Brighton’s woeful record at the Amex this year, Hughton felt home comforts are conducive to better performances. He added: “We’ve got a home crowd that have voiced their disappointment which I understand. “But even at 2-0 down they were trying to get the best out of their team and trying to be as vocal as possible. “I think you’d rather play at home, so I don’t think it’s a release of pressure playing away.